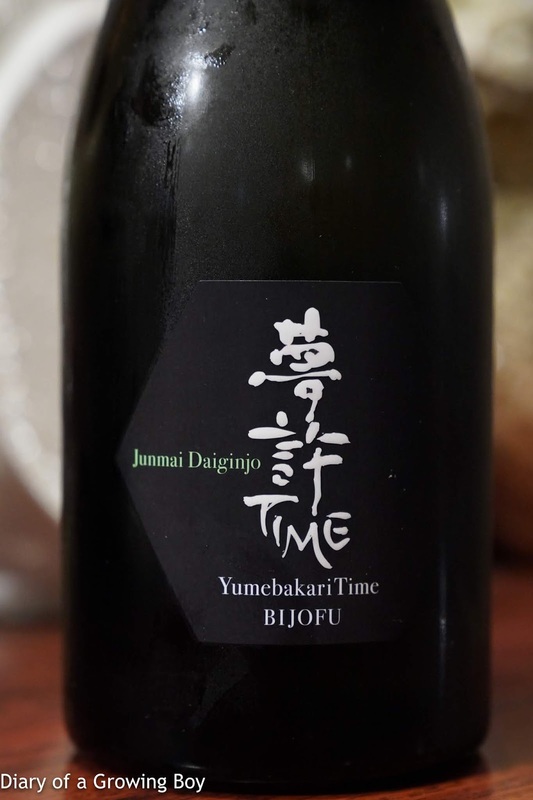 Bijofu Junmai Daiginjo Yumebakari Time (美丈夫 純米大吟醸 夢許 Time), 29BY - seimaibuai of 30%. 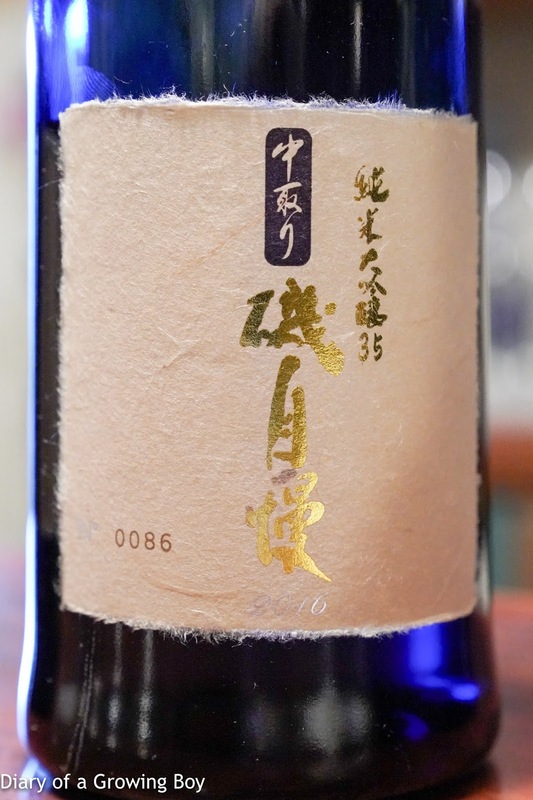 A koshu (古酒) aged for 3 years. 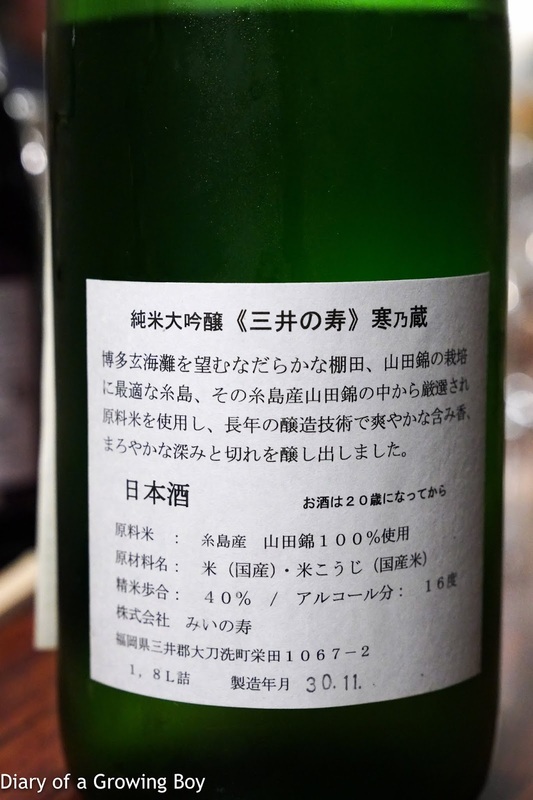 Nose showed a little cotton candy, peach, tropical fruit. Very elegant. Initially smooth and light on the palate but ended dry. 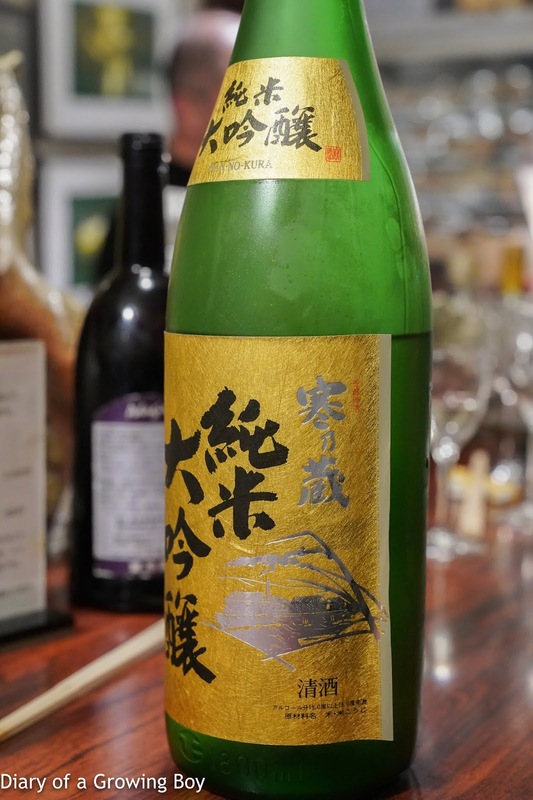 Master was kind enough to pour us a tasting portion of the non-aged Yumebakari so that we could taste the two side-by-side. 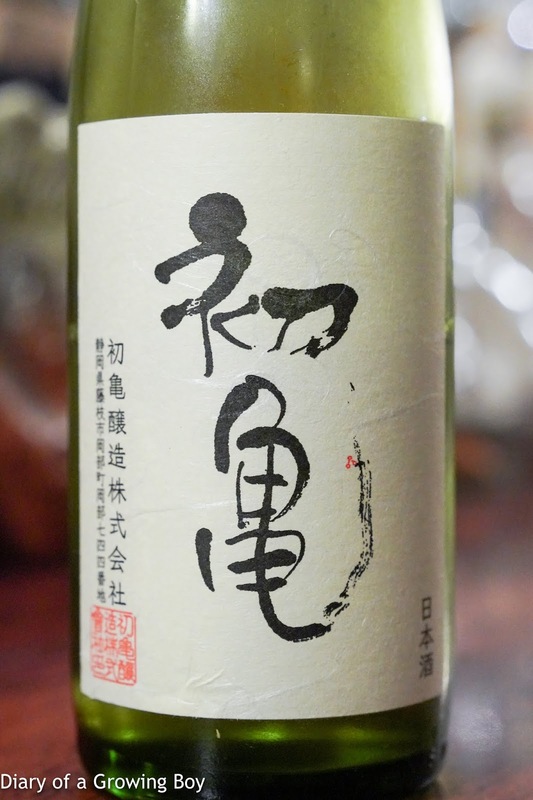 Bijofu Junmai Daiginjo Yumebakari (美丈夫 純米大吟醸 夢許), 30BY - seimaibuai of 30%. Really lovely nose with banana and floral notes. Nice and smooth, with slightly fermented notes. Sweet on the attack then showed a hint of spiciness. Yeah, Yumebakari Time was definitely the more elegant of the two. 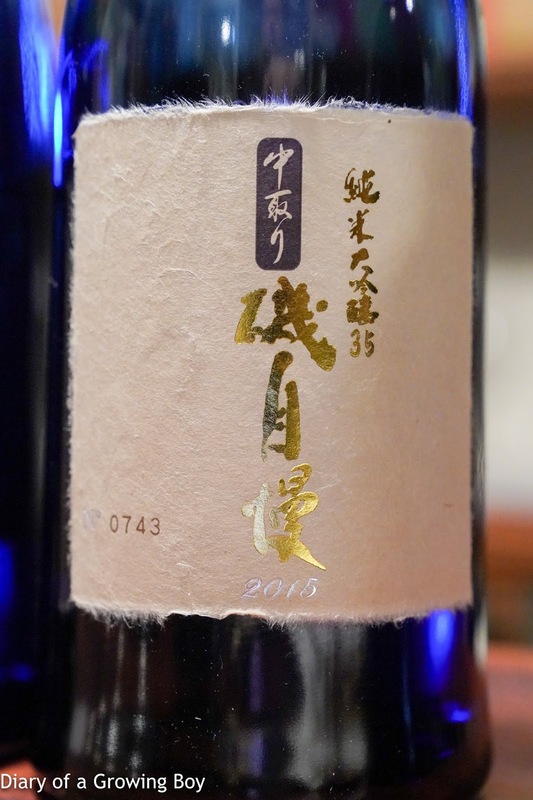 Hatsukame Show Special (初亀 鑑評会出品酒), 29BY - floral nose. 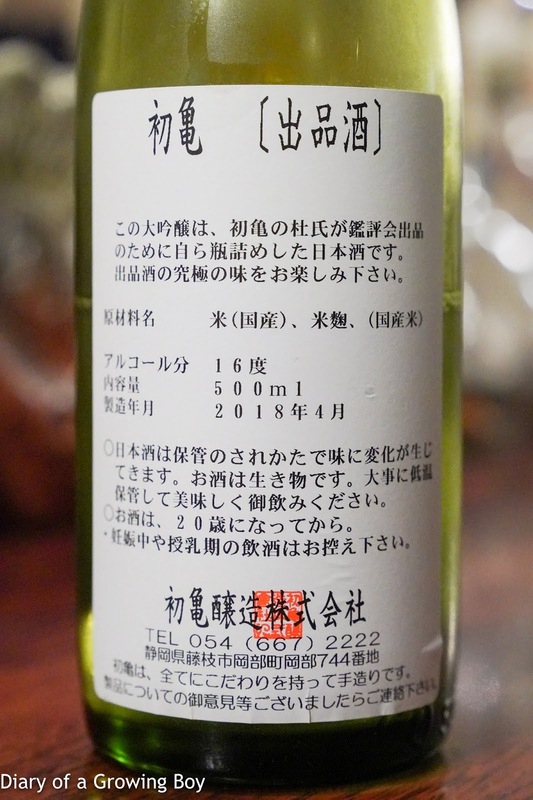 Good depth of flavors, which showed more of a dry mid-palate but not spicy. One of 34 bottles made. 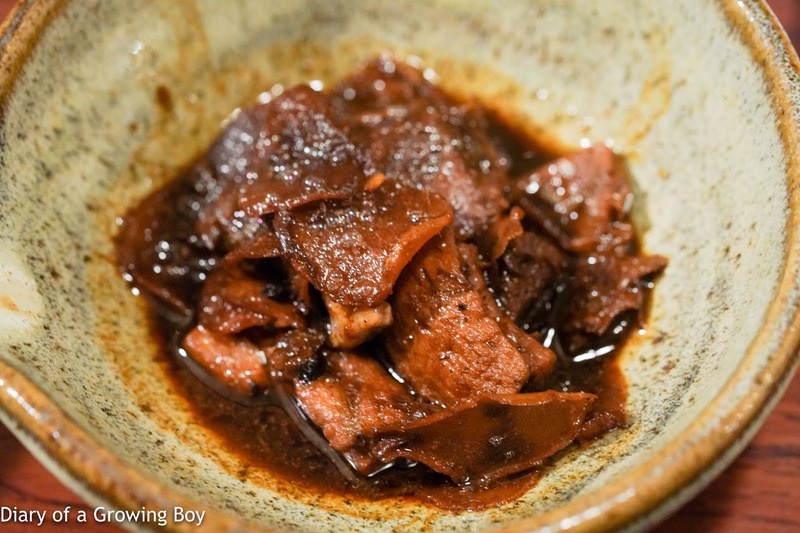 After stuffing ourselves with awesome yakiniku (焼肉), we went back to Tamanegiya for the second time tonight. DaRC and Ro Ro were already seated at the bar, and the place was packed. 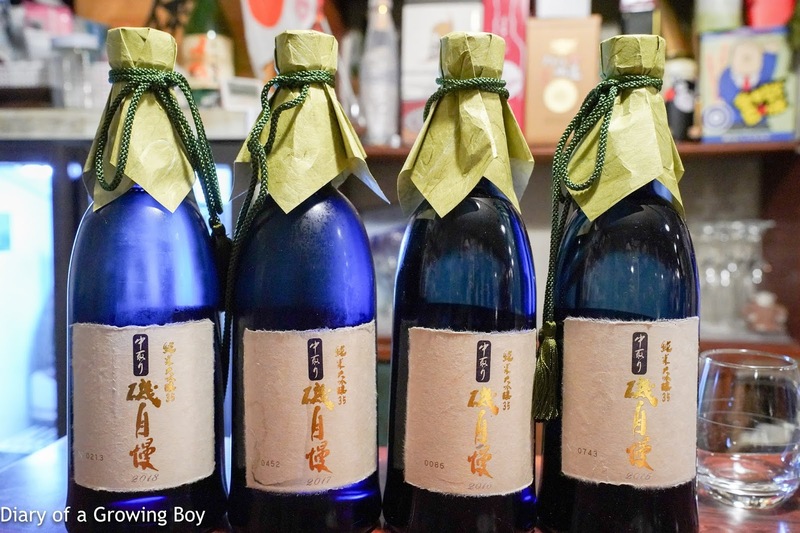 I just had to do my traditional vertical tasting of Isojiman Nakatori... And once again Master was kind enough to open fresh bottles of all 4 vintages. 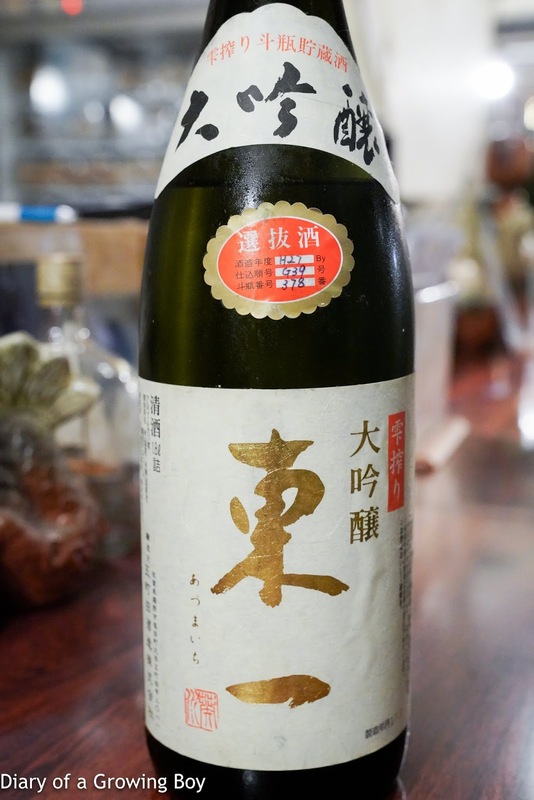 Isojiman Junmai Daiginjo Nakatori 35 (磯自慢 純米大吟醸 中取り 35), 26BY - best of the four. 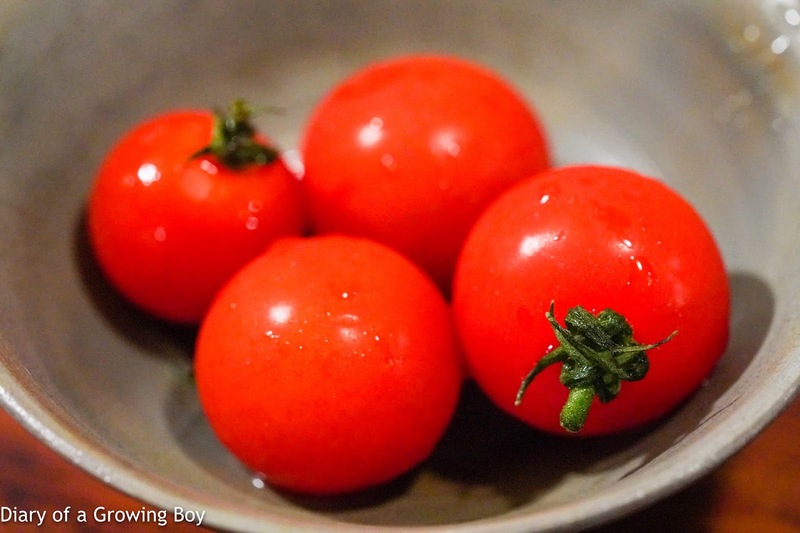 Really elegant, sweet, fragrant. Softer and a little sweet on the palate. 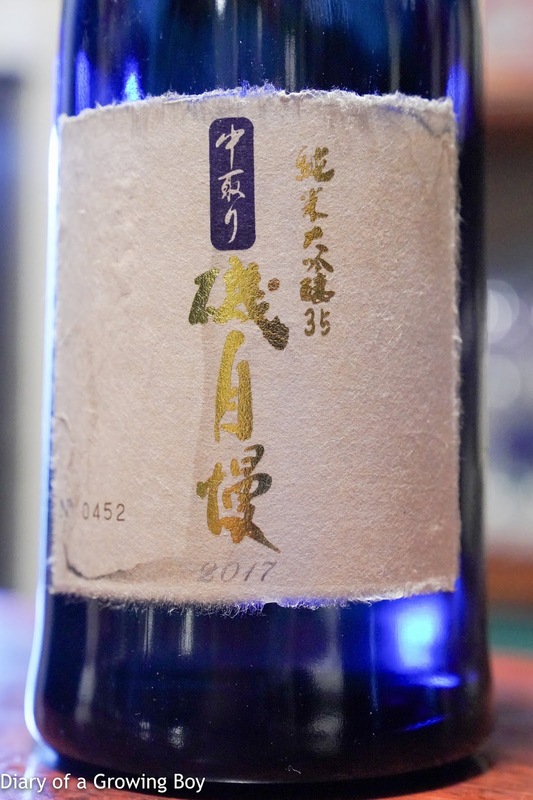 Isojiman Junmai Daiginjo Nakatori 35 (磯自慢 純米大吟醸 中取り 35), 27BY - nose of banana. Dry on the palate with good depth. 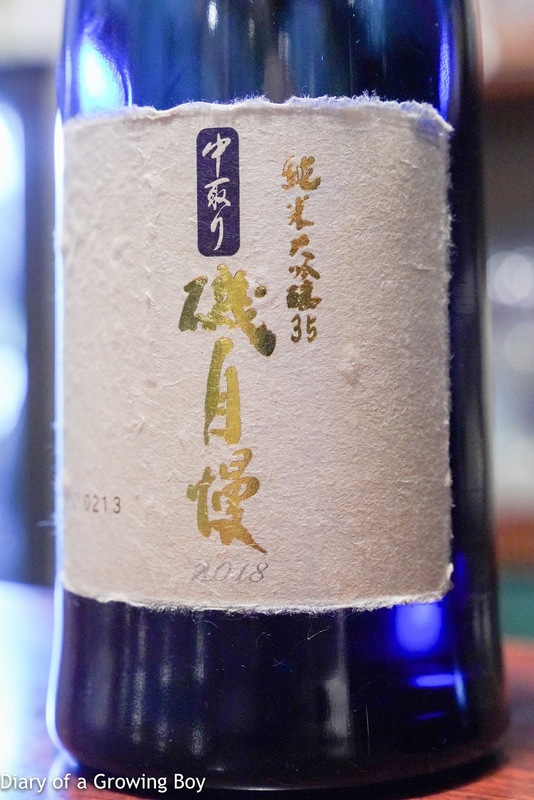 Isojiman Junmai Daiginjo Nakatori 35 (磯自慢 純米大吟醸 中取り 35), 28BY - lots of melon notes and really sweet on the nose. Almost like melon soda. Still a little sharp on the nose. Nice depth on the palate. 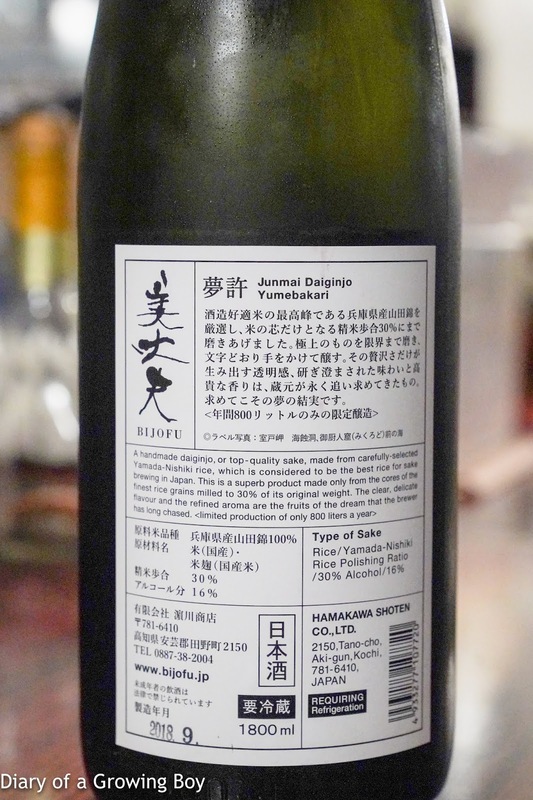 Isojiman Junmai Daiginjo Nakatori 35 (磯自慢 純米大吟醸 中取り 35), 29BY - really fresh, lots of musk melon, really sweet. A bit young and some sharp alcohol on the nose. 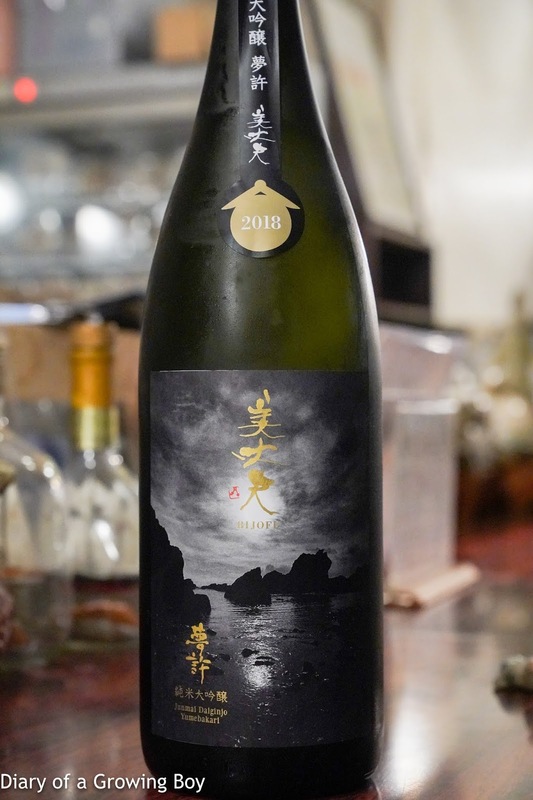 Miinokotobuki Junmai Daiginjo Kannokura (三井の寿 純米大吟醸 寒乃蔵), 30BY - seimaibuai of 40%. Light and sweet on the nose. Really ripe banana notes and starchy sweetness. Pretty sweet on the attack, a bit dry in the middle. Another wonderful evening spent here... and grateful that Master stayed open past his regular hours to accommodate us. 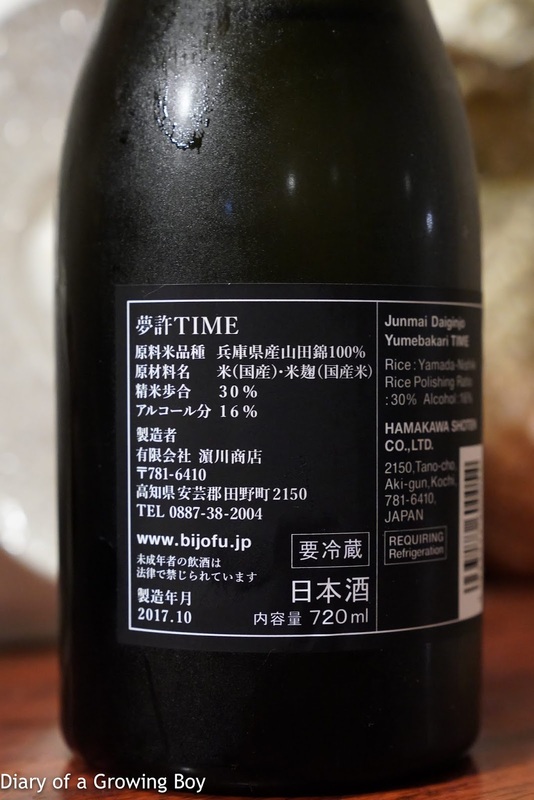 He also sent us away with a bottle each of the Bijofu unfiltered sparkling that the brewery custom made for him... which is always fun to drink.